As I wrote last Thursday 7 January 2016, a major bushfire was in our vicinity. As that day progressed, the situation got worse and with the hot dry easterly then north-easterly winds, 40+ C temperatures, tinder-dry country, the fire was uncontained and out of control. And it was headed in our direction. We were still some 30 km (20 miles) from the fire front, but by mid-afternoon, our locality was on the lowest of the three emergency alert levels, and a locality just 8 km (5 miles) north of us was on the next highest. With no expected change in wind direction, the fire was headed our way. Already the two highways between Perth and Bunbury had been closed, and people from various towns were being evacuated. We weren’t being evacuated, but the fire warnings were asking us to prepare for such a situation. One of the things that gets drummed into us with fire warnings is that if you aren’t prepared to stay and defend, evacuate early. And by ‘stay and defend’, they mean you must be physically and mentally capable of staying and defending, with an independent water source (large water tanks, swimming pool, dam etc. ), pumps and suitable hoses (not rubber garden hoses! ), and a generator because the mains power and water supply cannot be relied on. This is something that most people cannot do as it requires not only physical resources that most people living in towns or suburbs don’t have, but also requires physical and mental stamina to deal with some of the severest conditions a human being can endure. Because I have a terror of bushfires (as I found out in the January 2009 fires near Bridgetown where we lived at the time), my body was on a path to evacuate. My husband said he felt safe in our house; me, not so much. I actually think our house is very safe (if any house in Australia can be considered safe from fire), but a massive firestorm like the one heading our way was a different matter. Heat and smoke are more likely to kill you than the fire itself. So I packed up my computers, some clothes and toiletries, my ‘vital info’ folder, some woollen blankets, water bottles etc. and headed to my parents’ place in Busselton around 3:30 pm on Thursday afternoon (7 January). I spoke to my husband that evening and pleaded with him to join me, which he did the following morning, bringing the server, his computers, backup drives, some clothes etc. The house and its contents are insured, but nothing can replace a human life. I was very pleased to have him with me. 7 Jan 9:30 pm: Even though I’m safe, I doubt I’ll get much sleep tonight. The two towns within 10 km north of our house have just been put on a bushfire advisory. Not an emergency warning, but scary nonetheless. Who knows what will happen overnight, with still high temps, easterly winds, low humidity, and exhausted firies. And no aerial support until first light tomorrow. A good strong sea breeze would be very welcome, as it would force the fire back on itself. I have nothing but gratitude for those putting themselves on the line to save others and their homes. But mourn the loss of some of the best dairy farm country in our state and the very likely loss of prime livestock. 8 Jan 7:30 am: Our area is now on a bushfire alert (lowest level of 3). In fact the whole of outer Bunbury is on alert – Australind, Eaton etc. 8 Jan noon: Been offline for a while doing stuff with family. But we’re fine here (my husband arrived about 9 am). Hearts go out to those who’ve lost everything in these fires, especially those in my birthplace of Yarloop where 95 houses have been obliterated. 9 Jan 7 am: Reporting in…. We’re still safe at my parents’ place in Busselton. Based on the Department of Fire and Emergency Services (DFES) info this morning, the locality where our house is is still on Alert. 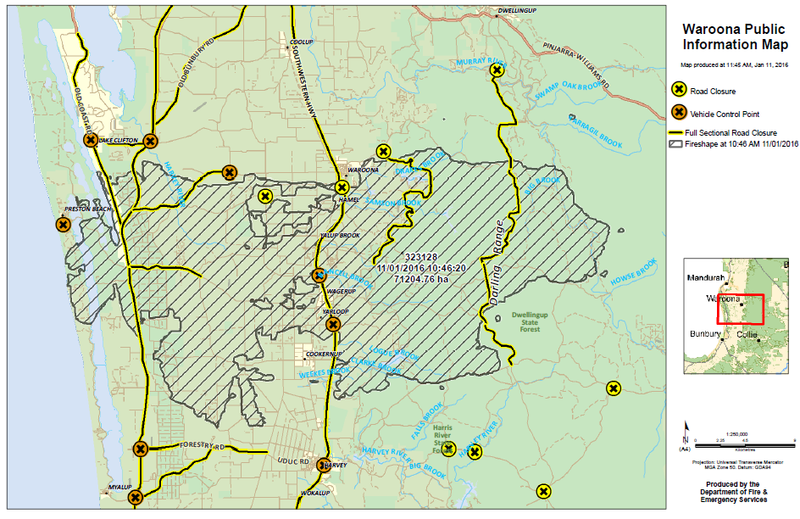 The bushfire had now burnt some 60000 ha and the fire perimeter is more than 200 km. The two highways between Perth and the Southwest remain closed and only essential traffic is being routed via Albany Highway/Collie. Yarloop has been devastated with the loss of 121 homes. I haven’t checked any news reports yet to see what other devastation there’s been. I won’t be checking FB much each day, but be assured we are safe for now and our house remains out of the high danger zone. 10 Jan Sunday morning update: We should go home today. The weather conditions have eased, and the wind is now blowing away from our area. I think the amazing firies saved Harvey last night, which along with Wokalup and Cookernup were under immediate threat. The consequences of this fire will be with us a long time – devastation of properties, a prime agricultural region, state and national parks, livestock (dairy and beef cattle, sheep, horses…), market gardens and orchards and wineries, wildlife, infrastructure (roads, bridges, power etc), tourism … And will be felt throughout the Southwest, which relies on summer holiday makers to survive the rest of the year. And of course all our insurance policies will increase. Our hearts go out to those who have suffered unimaginable losses, and our heartfelt thanks go to those who bravely face the fires of hell to protect our communities. 10 Jan afternoon update: We returned home this afternoon, once the weather conditions had eased and the fire starting going back on itself and in the opposite direction to our house. And after the warnings for our area and the nearby areas had been lifted. Note: The length of the scale for this map is 9 km (just over 5 miles). The locality of Myalup (bottom left corner) is 8 km from where we live. Click on the map to view it larger. A Stephen Swain on Facebook uploaded these two comparison maps just to give some perspective as to the area covered by the fire. The inner blue line is where the fire went; the outer blue line is the danger zone. The comparison maps superimpose the fire and danger zones over Sydney and London respectively, just to give you some idea of the size of this fire. This fire had a very personal connection to me, in addition to its location relatively close to our current home. It started near Waroona, where my paternal grandparents and my father lived from 1935 to the late 1960s (my uncle also lived there, but left before the others). It threatened Harvey, where my mother and her family lived from about 1939 or so until the late 1960s. My parents lived in Waroona after they married in the early 1950s, and Waroona was where my sister and I spent our childhood. And it destroyed Yarloop where my sister and I were both born (Waroona didn’t have a doctor or a hospital, but Yarloop, which was much smaller, did because it was a timber mill town). The old Yarloop Hospital where I was born and where I nearly died a few hours later, was totally destroyed, along with another 128 homes in Yarloop, plus many of this small town’s other buildings. Preston Beach was the closest beach to Waroona and it’s where my parents owned a beach block for several years, and where we used to go if we wanted to swim in the ocean. All this territory is very much part of my family history. The short-, medium-, and long-term consequences of this fire will be felt for a long time. Obviously there’s the impact to those who’ve lost everything — homes, farms, livestock, livelihoods, etc. I can’t imagine how they will cope. And there’s the impact on those brave heroes (and their support teams) who fought the many fronts of this fire saving strangers’ lives and properties, often when their own properties were being destroyed. I can’t imagine how they cope, either. My heart goes out to them all. There’s also the flow-on impact to the region. The immediate impact is from the closure of the two highways linking Perth and Bunbury. This would be similar (albeit on a much smaller scale) to closing the roads between Los Angeles and San Diego for a week and routing the traffic via a small state road that adds three hours to the usual duration of the trip. These two roads supply the southwest region with goods from Perth and the rest of the world, and equally, supply Perth and other places with produce. Having to detour both ways on a smaller, less-maintained road, adds costs both in time and fuel, and I’m sure the prices of some goods may increase. There may also be shortages of some products for a time. The affected area is a prime agricultural area for Western Australia, supplying much of the dairy produce (milk, cheese etc. ), beef cattle, citrus orchards, vegetable market gardens, etc. Cows still need to be milked, and if they aren’t milked, serious consequences can occur to both the cow and its milk. They also need to be fed — much of the pasture land where the beef and dairy cattle grazed is now a charred wasteland. I don’t know how many of the citrus orchards or market gardens were affected by either fire or smoke, but either could damage these producers for many months to come. And of course, all our insurance premiums will go up. Finally, this fire is not yet under control. Hot weather conditions are expected later this week, so hop-overs and spot fires could cause further flare-ups and damage. And if we get thunderstorms with lightning with that hot weather, then we could see a repeat of the past five days. Update 19 Jan 2016: Given time, more favourable conditions, and the resources thrown at it, this fire is now contained and controlled. And the best news? Overnight (18 Jan) we had some 20 mm of rain in the area — good soaking rain, too. So pleased you’re okay Rhonda. I knew you were close to it all when I received your email about all the smoke and the fire only being 35k away. Been thinking of you while it was all happening and hoping you were okay. I feel so sorry for everyone that was effected by the fires and those poor fire fighter, I don’t know how they keep going. Please know that we are with you, Rhonda. I am so glad that you and your family are safe. Our hearts go out to the people who have lost everything. Thank you for the detailed update. So glad you are fine. This is my first summer in a bushfire area. I’ve already “left” once, on an extreme fire day. No house is worth losing your life over.